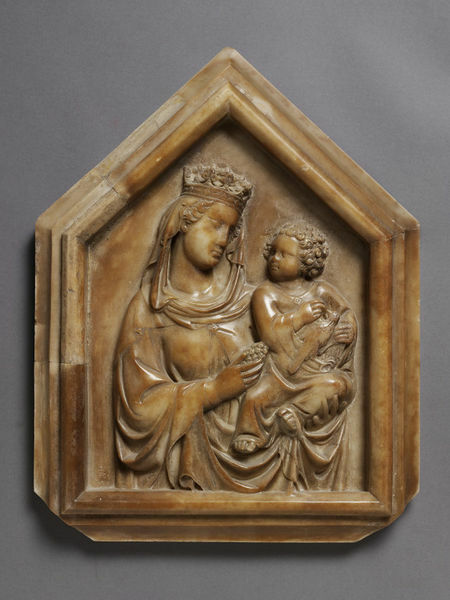 This Virgin and Child marble relief is made by Tino di Camaino in Italy, possibly Naples, in 1330. Camaino (ca. 1280 - ca. 1337) worked in Siena, Pisa, Florence and Naples for some of the most powerful Guelph and Ghibelline patrons of the day. The roots of his style are to be found in late 13th-century Siena, but during his long stay in Ghibelline Pisa it grew nearer to that of Giovanni Pisano. Marble relief depicting the madonna and child. The Madonna is crowned and holds a pomegranate, christ holds a chafinch. Bought from K. J. Hewett, Ltd., London, for £2000 (Murray Bequest £600, Horn Bequest £900 & Bryab Bequest £500). Formerly in the Loeser Collection, Florence. In 1923 then relief was in the hands of a dealer in Rome, passing to the Loeser collection at a later date, from which is was bought by Hewett at Sotheby's in 1959 (lot no. 175, £3,800). Gert Kreytenberg, "Ein doppelseitiges Triptychon in Marmor von Tino di Camaino aus der Zeit um 1334", in T. Michalsky (ed. ), Medien der Macht. Kunst zur Zeit der Anjous in Italien (Akten der internationalen Tagung im Liebeghaus - Museum Alter Plastik, 21-23 November 1997), Berlin, 2001, 261-274, esp. 268, fig. 6.